With the holidays coming up I thought I would make the boys a little treat: I made them a Minecraft inspired Tic-Tac-Toe board with Steves and Creepers! It took the whole school day to do (between school runs, baby feedings, toddler potty training etc) and I have to admit I am really really proud of it! The kids have really enjoyed it. 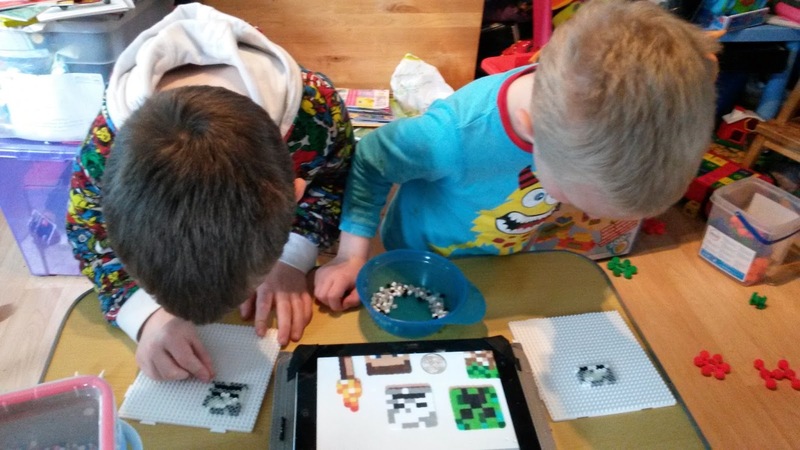 In fact they were so impressed that they wanted to have a go at making some Minecraft Hama Bead stuff too! So this afternoon while the younger two were taking naps I got the stuff out, found some patterns on Pinterest (I have found loads, check out my Hama Beads board) and gave them the ipad to copy from. Awesome combination of screen time, crafting, and family time!